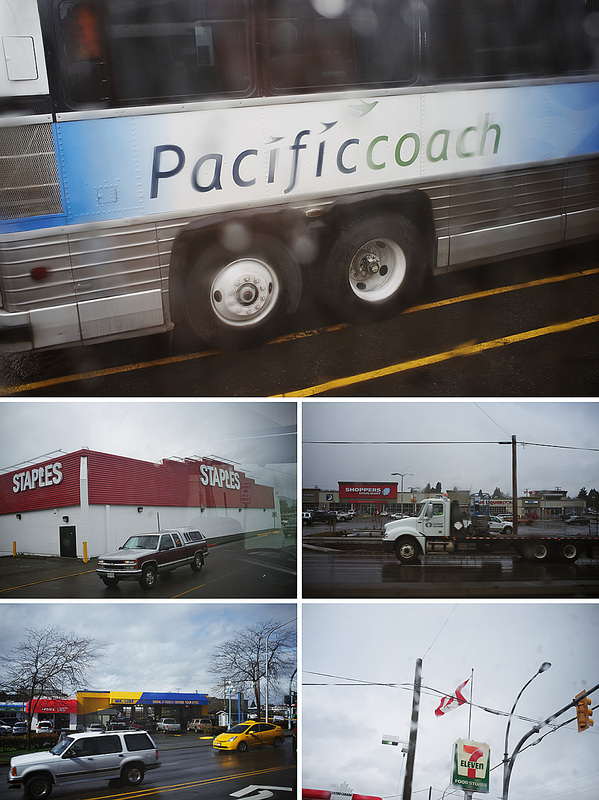 A wet winter’s day, waiting for the coach from Victoria to Nanaimo. Time to board. “You need photo ID for those tickets”. Uh, oh. Apologies. The “I’m a stupid foreigner” excuse. We’re allowed on, with a disapproving sigh. Find seats. Seats that get a window view for an excited three year-old. The air is warm and moist, as everyone’s coat start to steam. Condensation on the inside of the windows, rain forming rivulets on the outside. The most mundane of journey’s to locals, off to visit family, conduct business or have a wet day out. To me, every mile we travel seems exotic. Lumber trucks carrying trees to mills. Low-rise buildings advertising unknown brands. Cars I don’t recognise. Even the road signs entice me, with strange-sounding names set in an unfamiliar typeface. The journey is coming to an end. Will our distant friends be waiting?